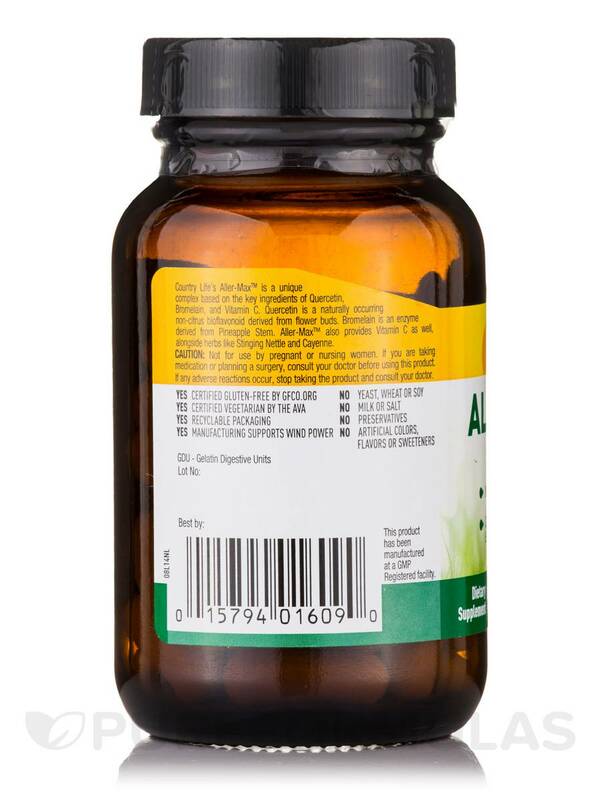 Aller-Max™ Capsules from Country Life® provide a specially designed formula that contains beneficial ingredients like vitamins A and C‚ quercetin‚ N-Acetyl Cysteine (NAC)‚ bromelain‚ stinging nettle‚ cayenne‚ and grape seed extract. This supplement from Country Life® is made to provide antioxidants and their related benefits. Vitamins A and C are known to boost immunity and also support cellular health. Quercetin is a non-citrus bioflavonoid that is rich in antioxidants‚ while bromelain is an enzyme obtained from pineapples. 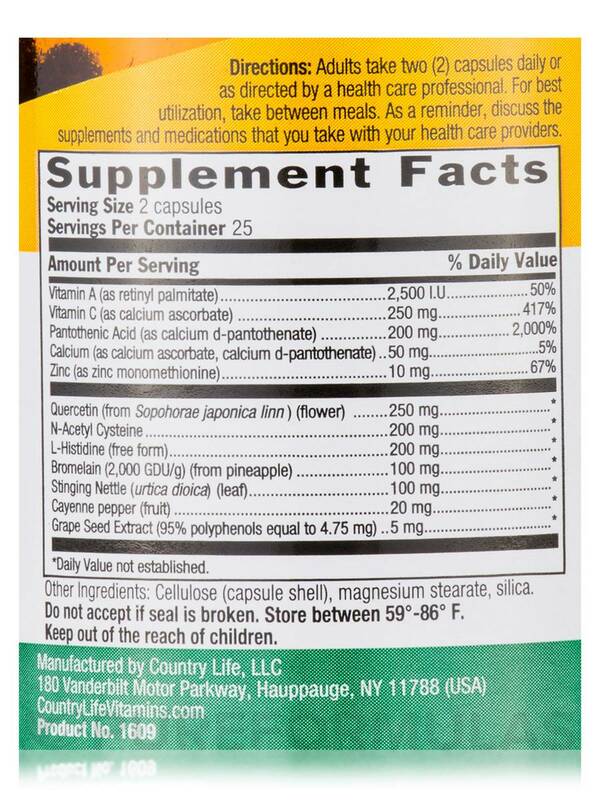 Bromelain is known to support and promote healthy digestion. Grape seed extract is also rich in antioxidants. N-Acetyl Cysteine is a form of the amino acid called cysteine and might improve the production of glutathione‚ a beneficial antioxidant. It can also support the immune system in various ways. The supplement also contains cayenne‚ which could help break down congested mucus. It may also help relieve the effects of a mild cold. Cayenne present in Aller-Max™ Vegetarian Capsules from Country Life® could also act as a digestive aid by stimulating the digestive tract and increasing the flow of gastric fluids. Other Ingredients: Cellulose (capsule shell)‚ magnesium stearate‚ silica. Certified Gluten Free. Certified Vegetarian. 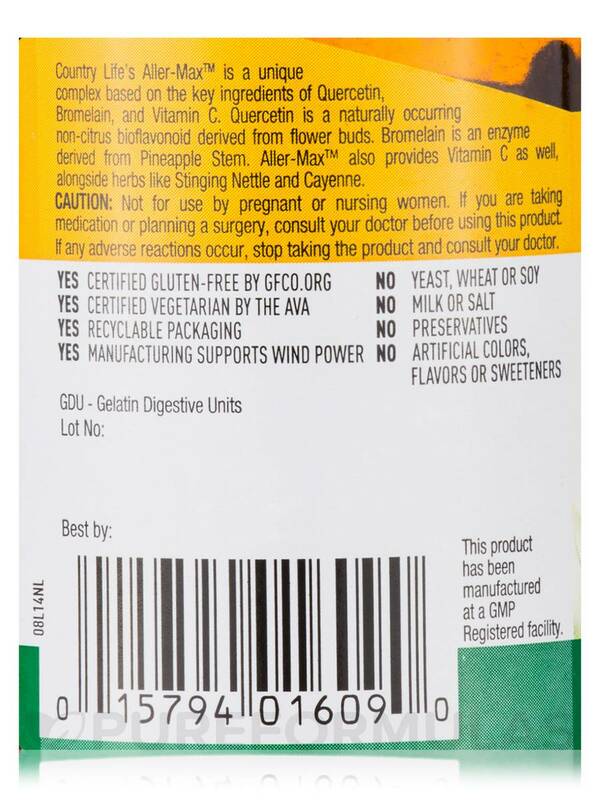 Does Not Contain: Yeast‚ wheat‚ soy‚ milk‚ salt‚ preservatives‚ artificial colors‚ artificial flavors or sweeteners. Adults take two (2) capsules daily or as directed by a health care professional. for best utilization‚ take between meals. As a reminder‚ discuss the supplements and medications that you take with your health care providers. Not for use by pregnant or nursing women. If you are taking medication or planning a surgery‚ consult your doctor before using this product. If any adverse reactions occur‚ stop taking the product and consult your doctor. 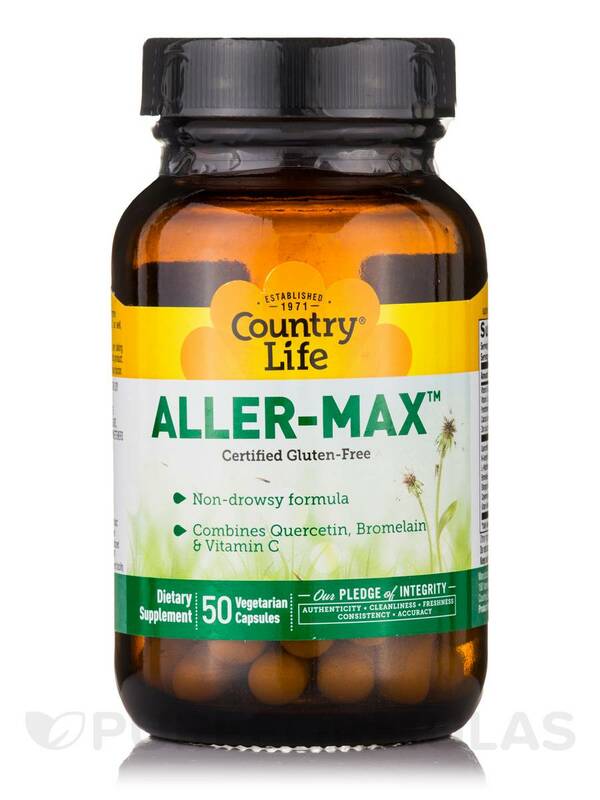 I use Aller-max by Country Life to boost my immune system when my allergies act up or I'm going to be around dogs & cats. I take it for about 2-3 weeks then quit for awhile. I guess you could take it daily, but I like to take a break from pills and just take it when needed. No after taste, has good variety of herbs in it. Never take an allergy meds again! Aller Max by Country Life changed my life, I have had severe allergies my whole life and this product changed all of that! I just take 2 supplements a day and I don't have a single allergy. And I used to be allergic to everything! I love this product!! Aller-Max was recommended to my by a friend and I have been using it for years. It is an all natural and totally effective way to replace expensive prescription medications. I highly recommend Aller-Max.